Week 18 – Here’s what women talk about when they hang out together. I’ve just returned home from the first “Self Care by the Sea” retreat held at the Stage Neck Inn in York, Maine and it was a beautiful maiden voyage. 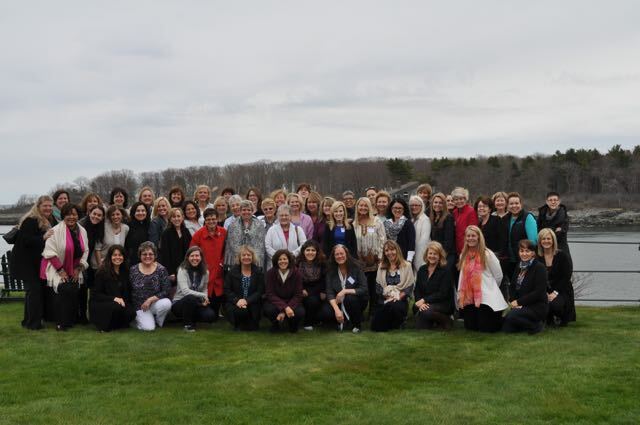 Fifty-five women from around the US, ranging in age from 34 to 78, spent three days in a gorgeous room overlooking the ocean and we had a ball. We talked about how to carefully pull the rug out from under our own lives so the Universe doesn’t have to do it for us. We discussed the hero’s journey and how any challenge – a deteriorating relationship, a diagnosis, or an unexpected loss, can be viewed as a doorway that leads to a more authentic, soul-directed life. We reviewed the best resources to take on a spiritual pilgrimage so the journey isn’t so bumpy (or scary). We pledged allegiance to the navigational powers of intuition and feelings. We reverse-engineered experiences that sparked awe and wonderment in order to create more. We affirmed the existence of synchronicity and grace as divine reminders that there are unseen forces at work on our behalf. And we laughed. A lot. At ourselves, the world, and sometimes even each other. It’s a magical thing when women come together. We find our voices, our deepest needs and desires, and the courage to make the changes we know we need to make. This retreat was born from an impulse to teach closer to home and to use the healing power of the ocean to facilitate a life-shifting experience for women already on the path. Mission accomplished and tonight I go to bed grateful, bowing to the women who joined me on this new adventure. Watch what happens when Beethoven and Led Zeppelin come together in this video, here.